I’ve been staying for the past couple of days with friends from Cambodia that now live in Blackheath. 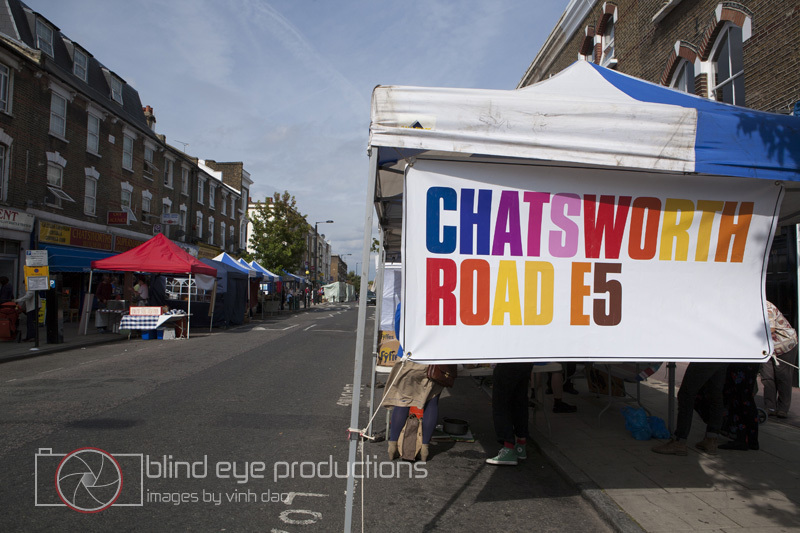 The girls wanted to do some shopping so Brandon (my host in Blackheath) and I had a chance yesterday to head to a little known street market in Hackney named after the address and post code Chatsworth E5. Not as big or diverse as the Borough Market in the center of London but was definitely worth the 3 changes on the Tube to get there. 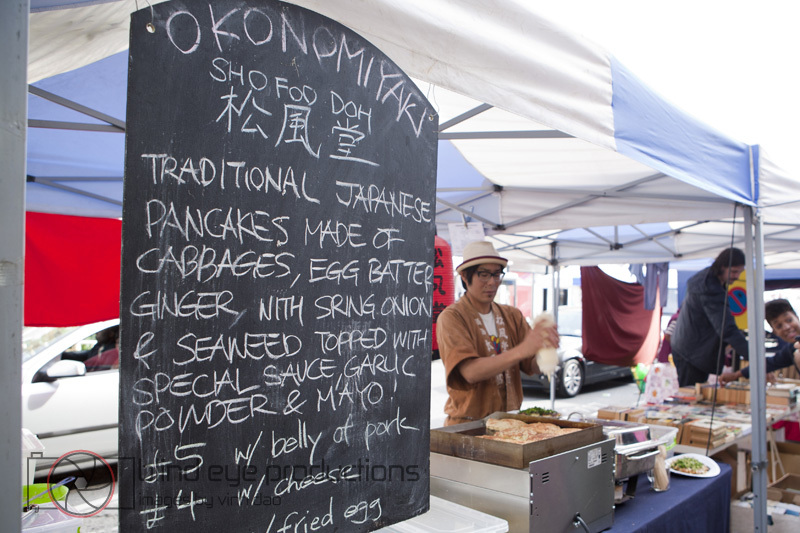 With about 50 stalls, it’s not the biggest street market but has some excellent options for food and has a very local feel that the Borough Market might have had a few years ago. 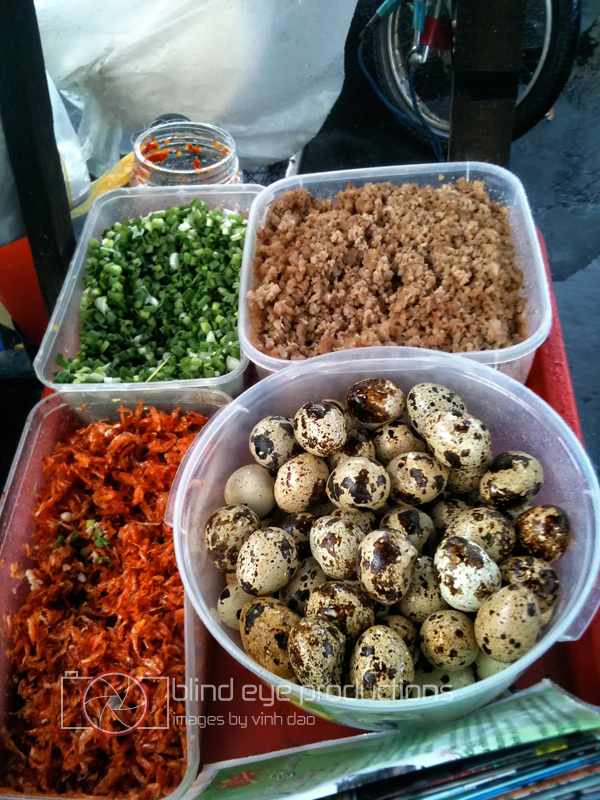 We did a fast reconnoiter of the food stalls and found all of them irresistable. We could only choose 3 and after much argument and a quick coin toss, we started our foray into the food at Chatsworth E5. The first place we went was the Kimchi Cult stall which is run by Danny, a Londoner who spent a couple years in Korea, eating up the local street food while teaching. 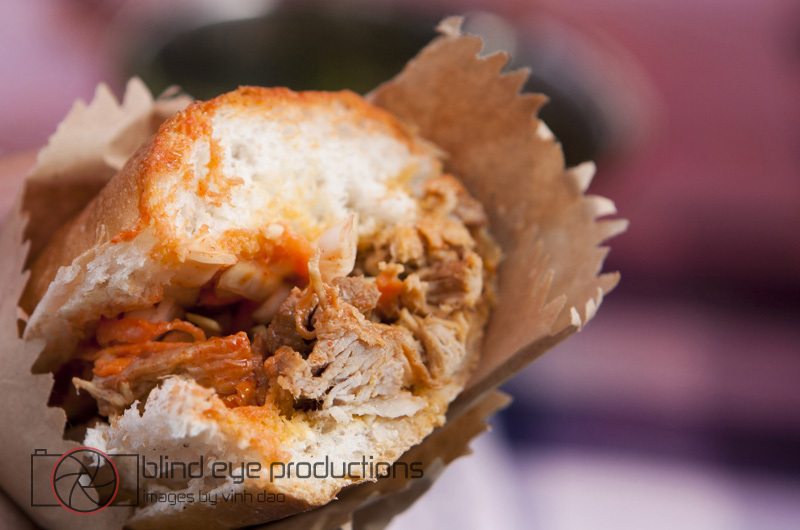 Unfortunately the kimchi slider’s weren’t available but we had a great pulled pork sandwich with ginger coleslaw. 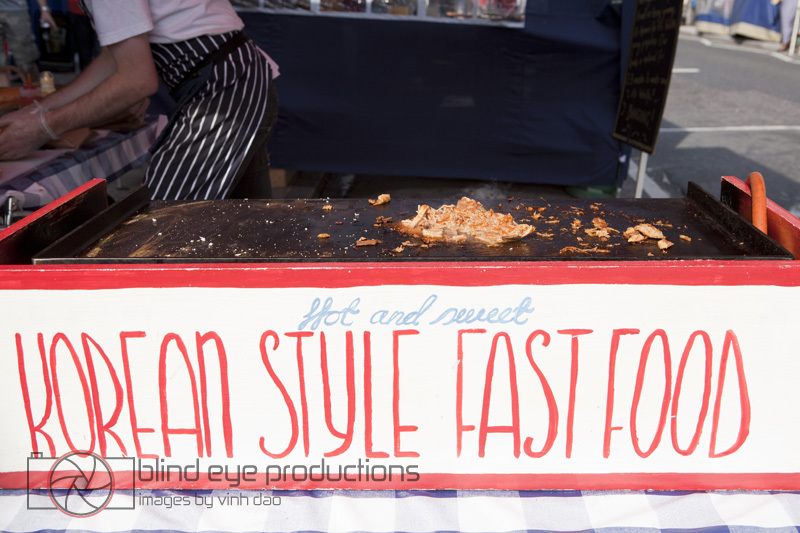 The great thing about the stall is that he cooks everything to order but only takes about 5 minutes to prepare. 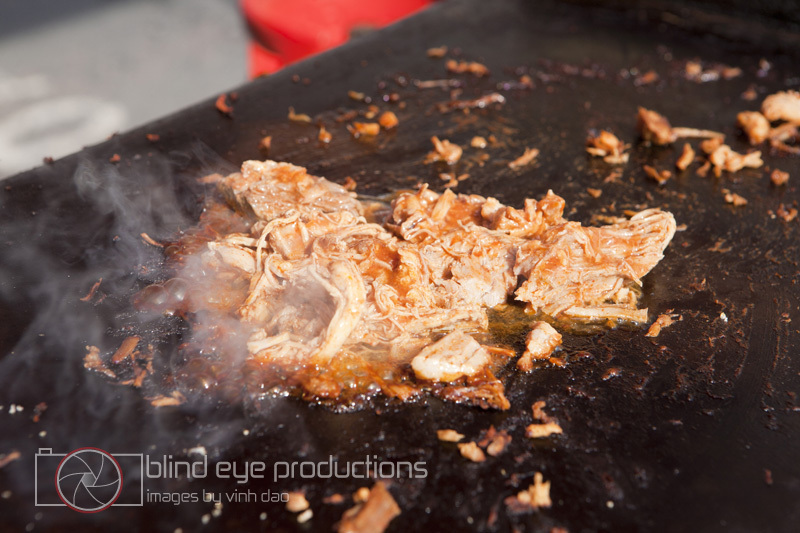 The pork was a sweet yet punchy affair with the ginger coleslaw giving an added crunch to the sandwich. 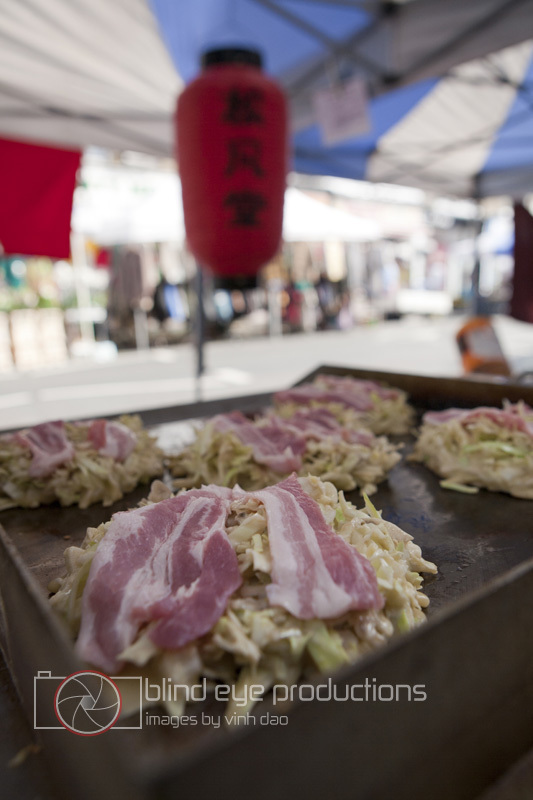 After the Kimchi Cult, we headed off to Sho Foo Doh stand which only sold one item: Okonomiyaki. I’ve only had this dish once before during the Happa review and didn’t really care for it but wanted to give it another shot. 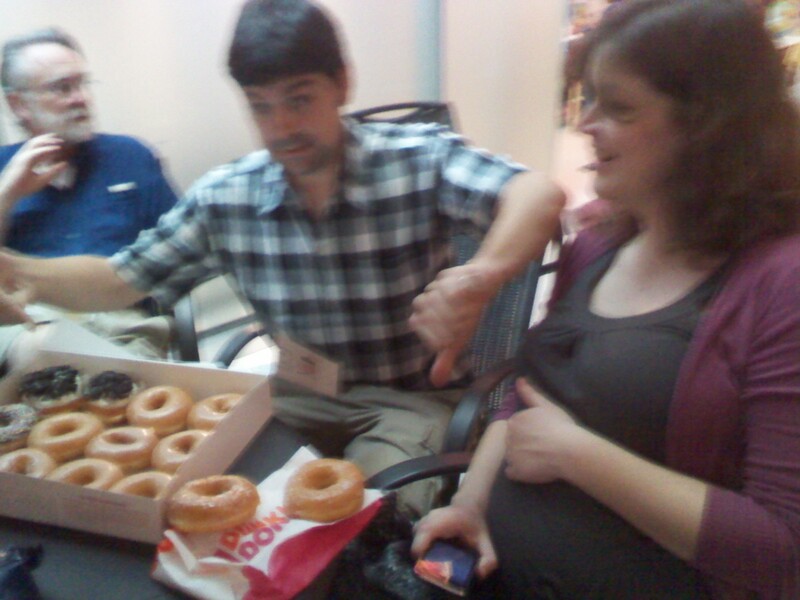 Oh was it good…. What I really dug about this version over the one at Happa was the cheese was placed in the potato mix so it had a richness to it that wasn’t overly cheese filled and a sauce that wasn’t too sweet. 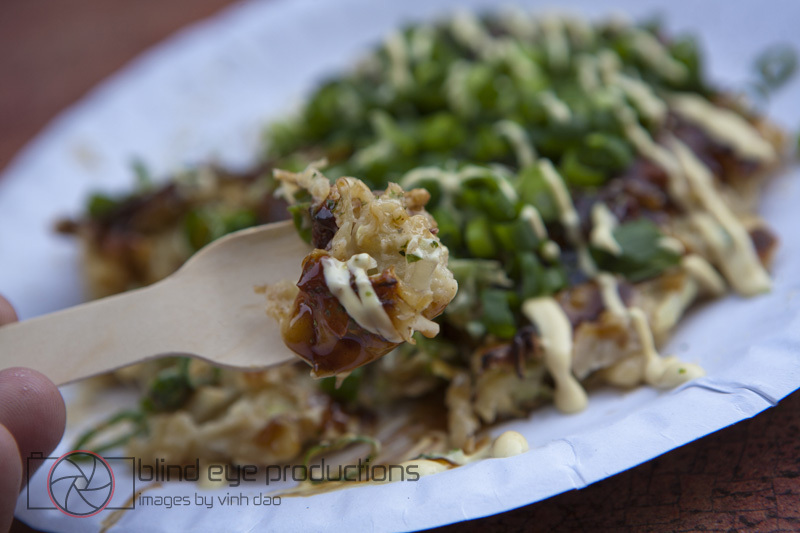 Added with some pork belly and a healthy dose of green onions, it made for an Okonomiyaki that I would come back for. The last place we tried was Banhmi 11. 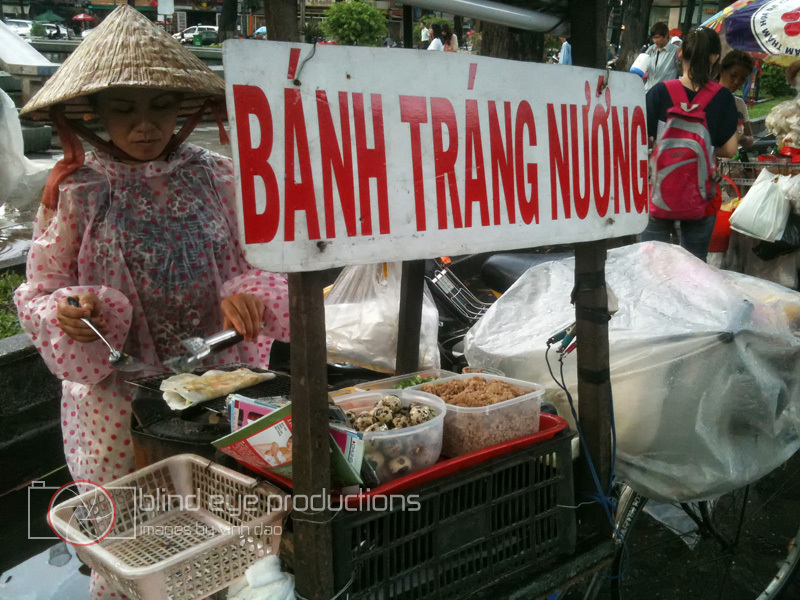 Advertised as bespoke baguettes at their stall, they give several options for their banh mi. After waiting in line for what seemed to be an eternity (bespoke baguettes take a while to assemble) , we ordered the BBQ Squared banh mi which had pate, caramelized pork meatballs with roasted rice flavours. Unfortunately, the long wait time allowed our stomachs the time to fill up and left us wondering if we had the room to fit even more food in our bellies. 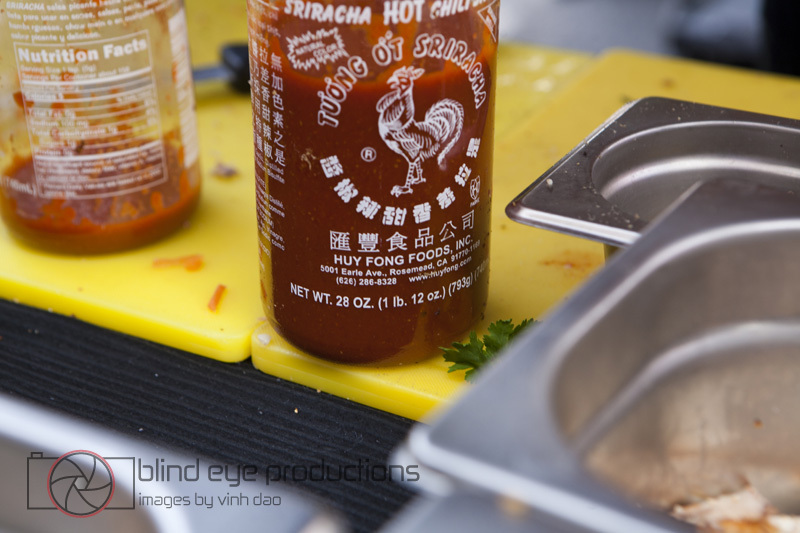 Luckily, I spied a huge bottle of Sriracha on their mise en place and after coming in for a closer look, and noticing the Huy Fong label, immediately became hungry again. The banh mi was completely worth it. Lots of char-crusted meatballs smashed together with pate and surprisingly, pork floss which I haven’t seen in years! 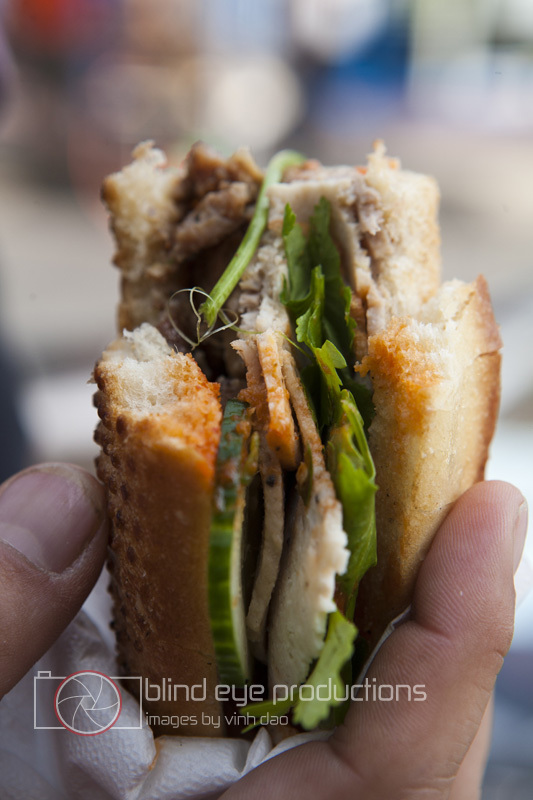 Add in pickled carrots, cucumbers, a heap of cilantro, Sriracha and green chiles in a spongy on the inside, crunchy on the outside baguette and we had a banh mi that was in my top 5 all-time list. 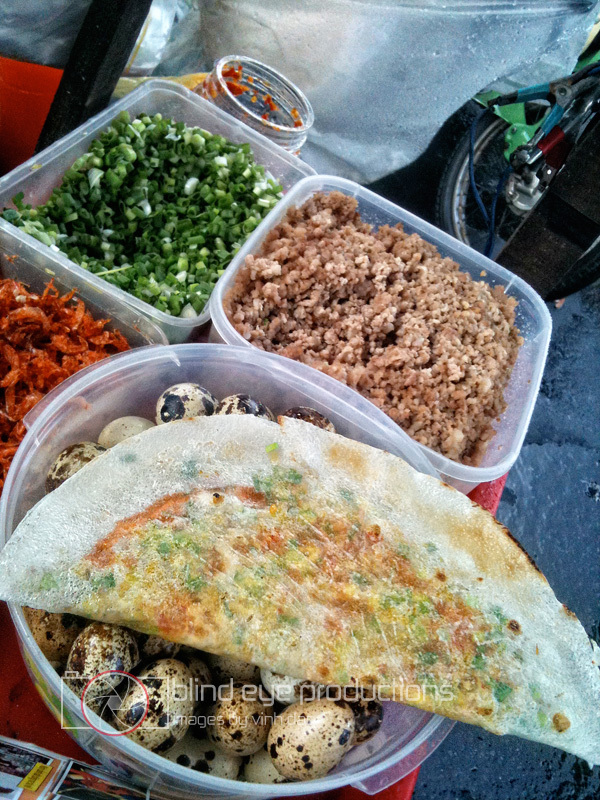 There were other notable food stalls that were just as busy as the ones we ate at. 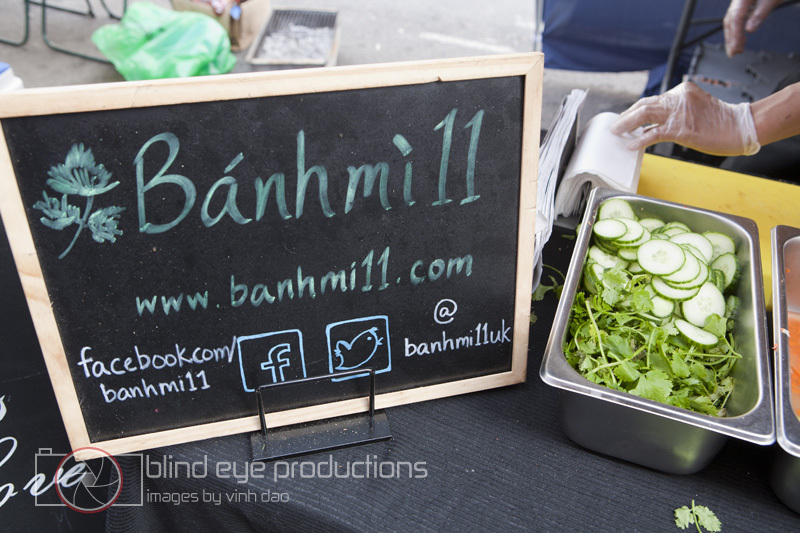 Notably, the wrap stall next to Banhmi 11 almost had us when we saw a kofta wrap being eaten next to us. Also, there was a Mexican street taco stand that had some amazingly fresh guacamole! The place was pretty rowdy back in 2004. 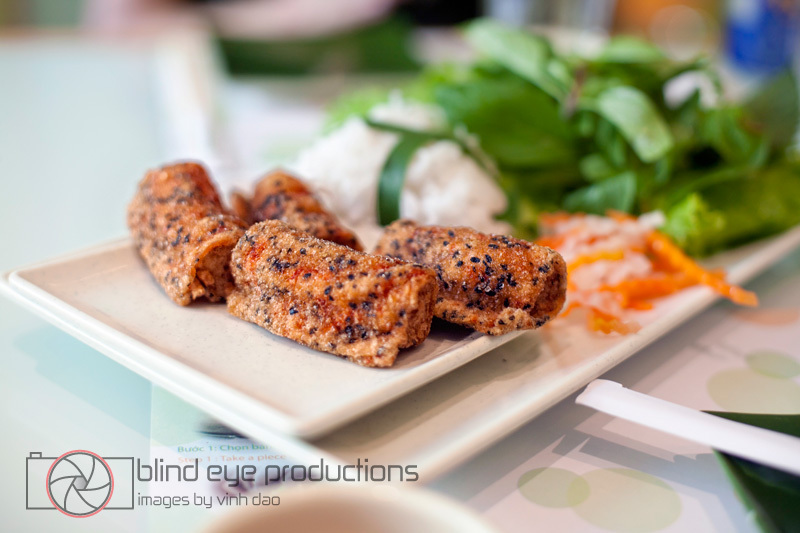 We named it Loud Vietnamese due to the ear-splitting techno music that thumped in the joint. The first time I was there, I saw a very drunk teenager in her school uniform carried down the steps by her friends. All I could think at the time was this place ought to be interesting. The patronage at that time was a bit sketchy, you had to yell to keep up conversation and stupidly cheap beers with ice were the norm. The menu wasn’t as diverse as it is now but they had a great chao tom (grilled ground shrimp wrapped around a stick of sugarcane) for 3,000 Riel which made for a handy snack after a night of boozing. Around 2007, the place was remodeled and looks pretty much like it does now. They got rid of the loud techno which drove the kids away but made conversation a bit easier. 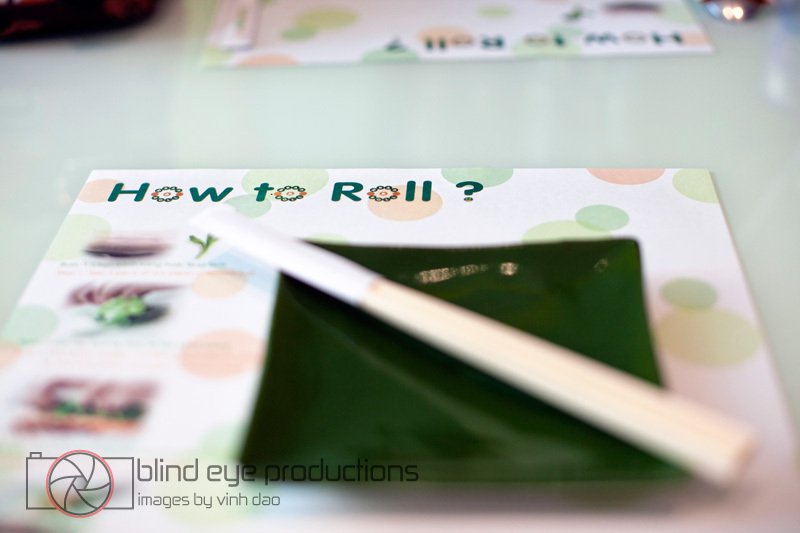 They also revamped the menu and now offer some very tasty dishes. Enough history. Lets live in the now and get to the food! 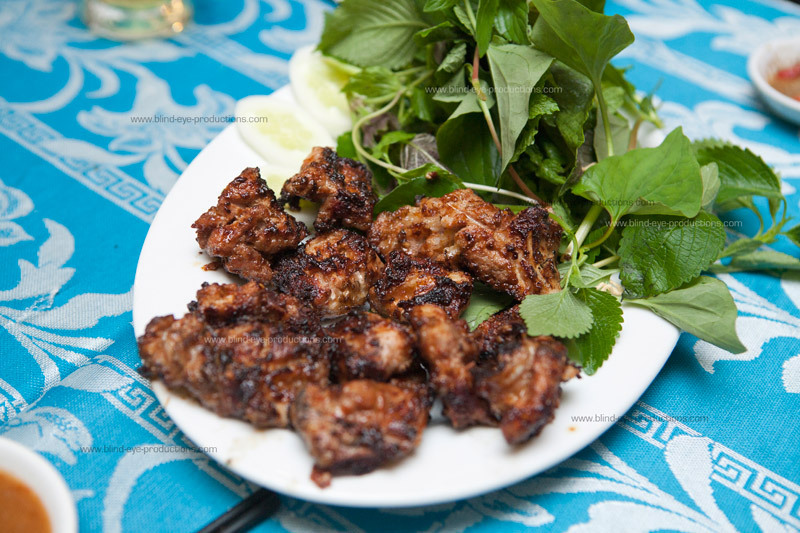 First to come up was the Thit Neung Heo (Grilled Pork Ribs $3.50). Having a nice char from the grill, the ribs were exquisitely balanced between sweet and salty and made for a great start to the meal. Ten minutes after we received our first dish, we started getting the orders on top of each other. 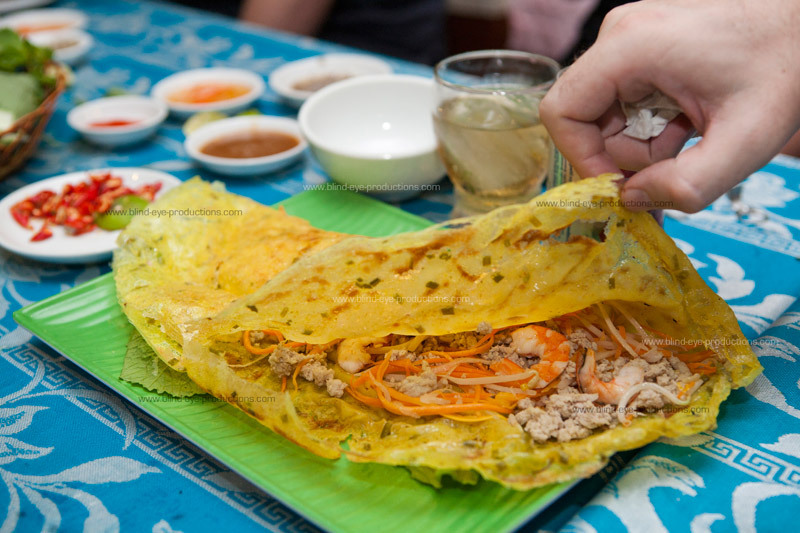 The Banh Xeo (vietnamese pancake $2.00), Muc Chien Ngon (fried crispy squid $4.50) and Goi Bo Tai Chanh (rare beef lime salad $5.00) came next. 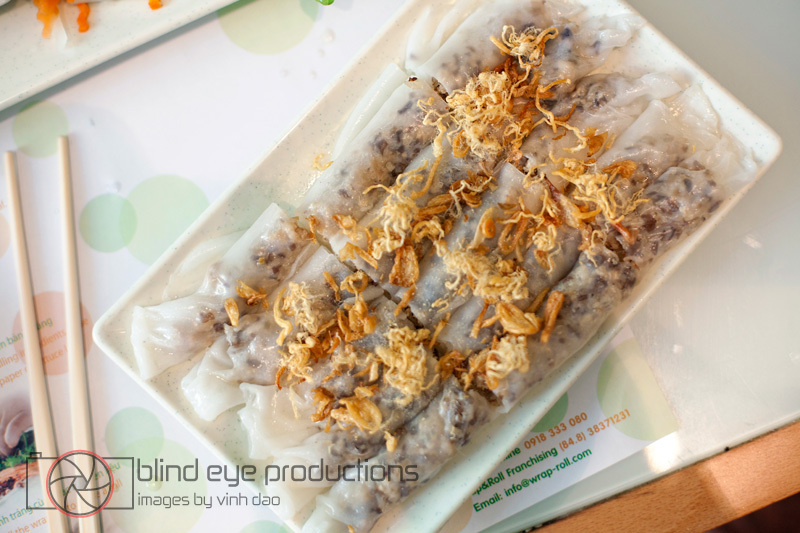 The Banh Xeo was chock full of ground pork, shrimp, julienned carrots and sliced onions. 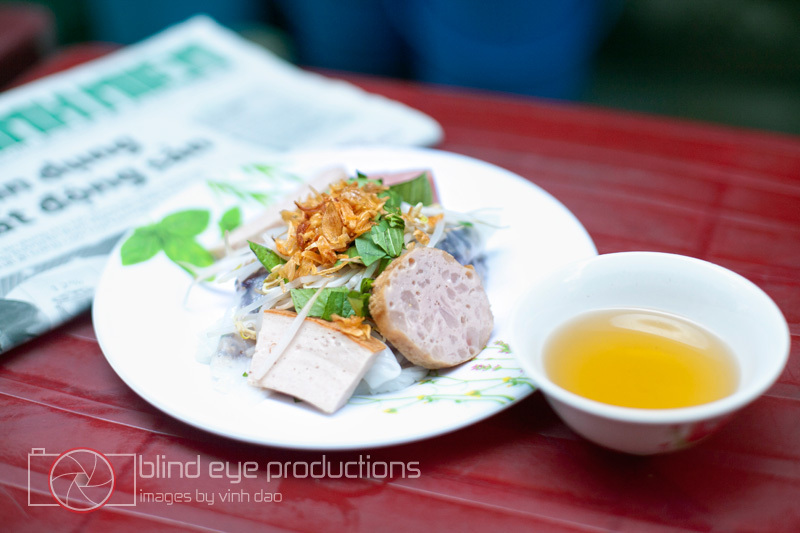 Goi Bo Tai Chanh is always favorite with me. 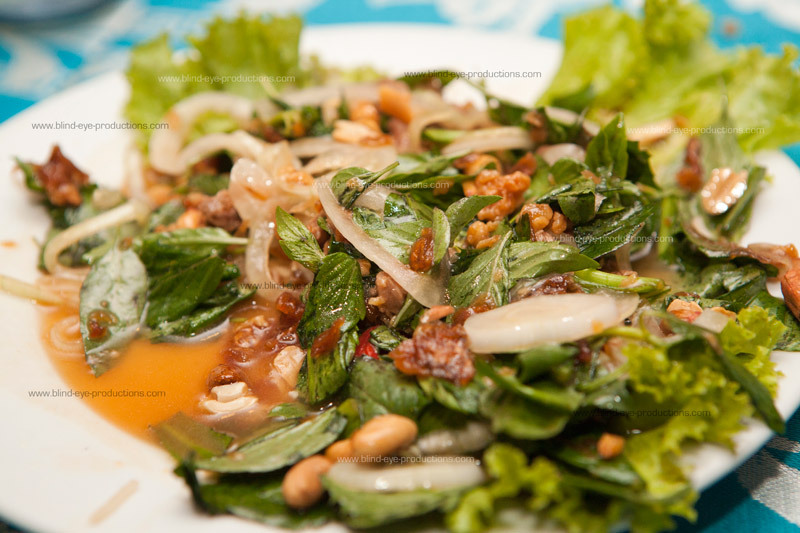 This version is filled with rau ram (vietnamese coriander), basil, mint, sliced onions and tossed in a sweet lime sauce. 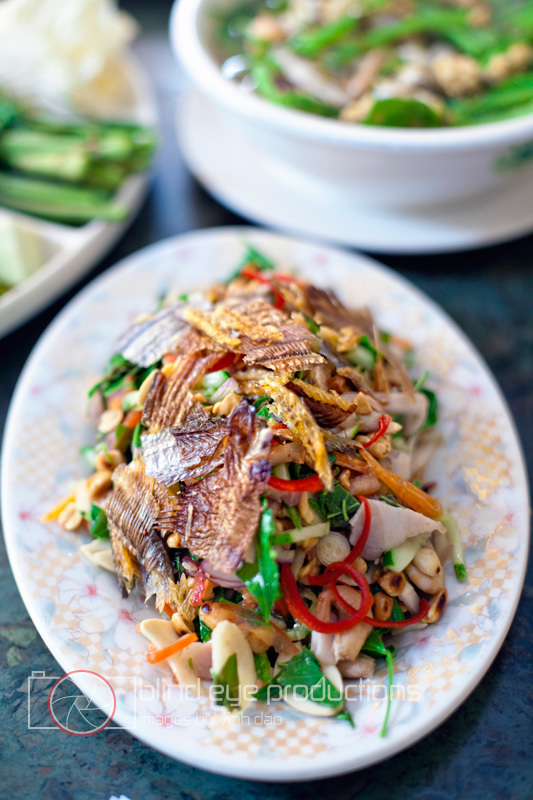 A bonus was the addition of fried shallots and peanuts for garnish. 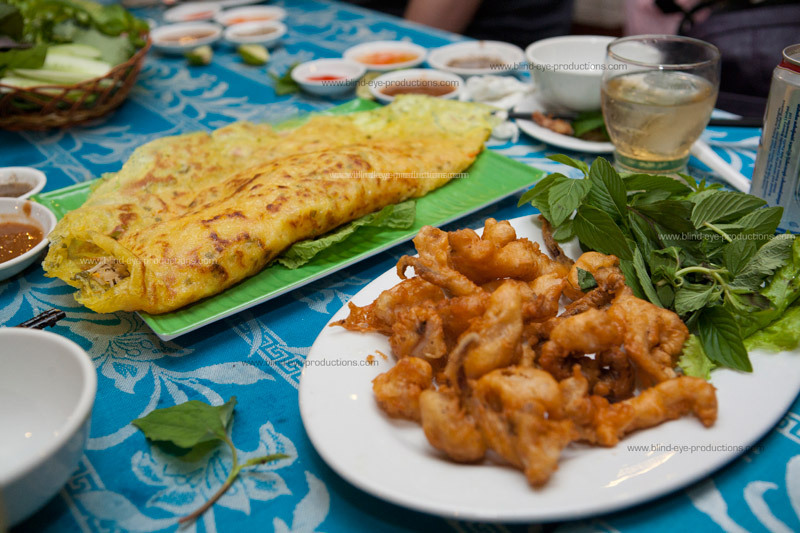 The Muc Chien Ngon was nice but I felt that the breading that they used was to too heavy and overpowered the delicate taste of the squid. 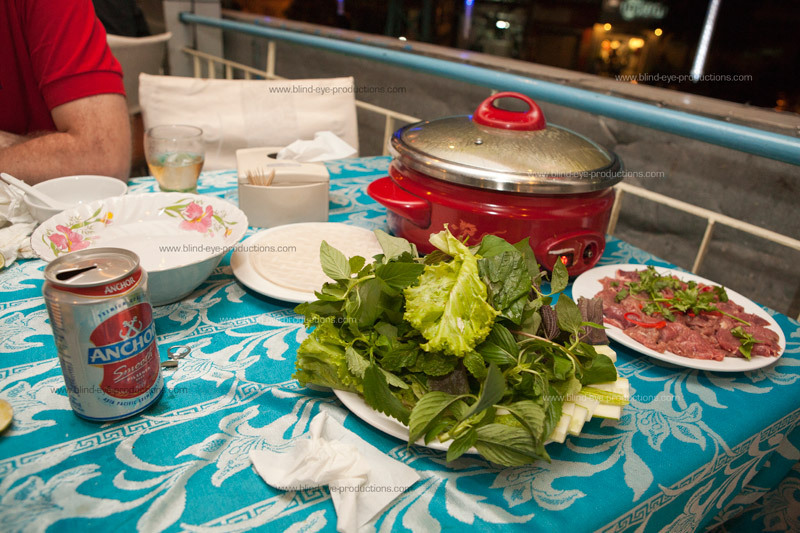 During this time, the Bo Nhung Dam (thin sliced beef boiled in vinegar $6.50) was delivered to the table but placed on the side. The very attentive staff waited until we finished a couple of plates before setting it up which was very thoughtful of them. 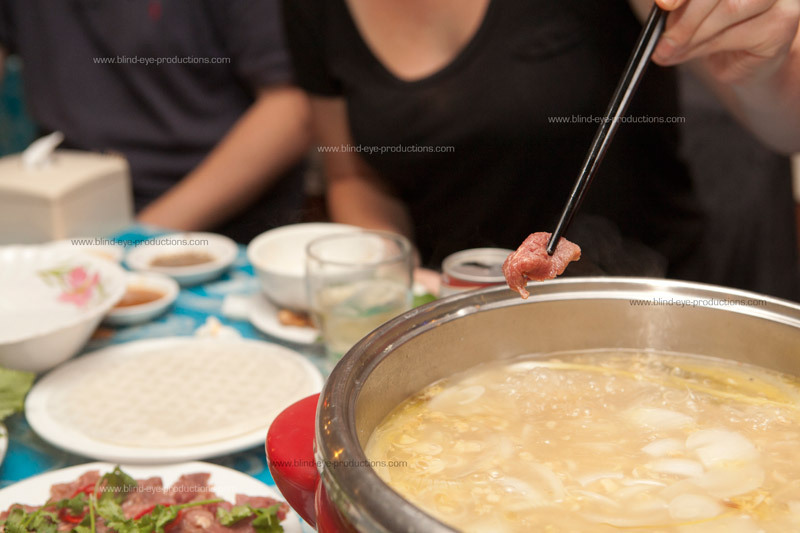 A Vietnamese take on Shabu Shabu, the raw beef is placed in the vinegar broth and the accompanying sides are used to garnish. 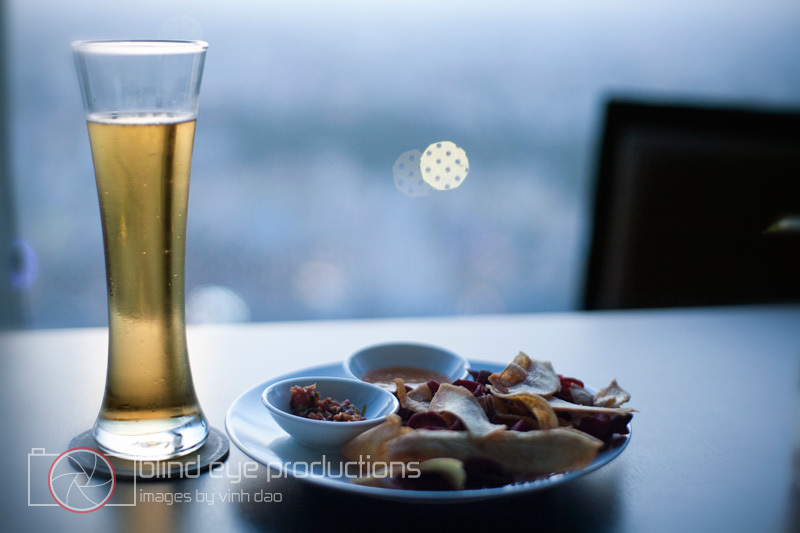 Here, the sides were some dry banh trang (rice paper sheets), a bowl with some water to dip the banh trang in, a few cups of nuoc cham (dipping sauce), rice noodles, various herbs and lettuce. 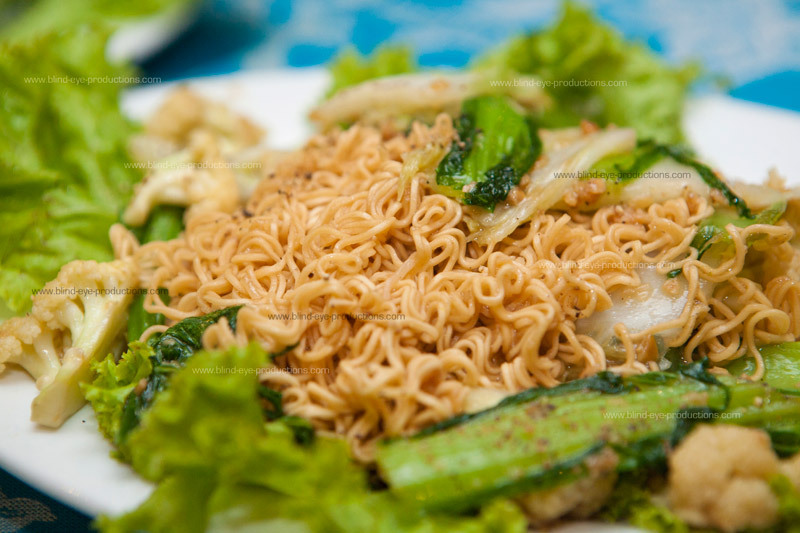 The last dish we received was the Mi Xao Chay (fried vegetarian noodles $3.00). I was shocked to see ramen noodles were used instead of the usual noodles I’m used to. To my surprise, the noodles weren’t too bad! 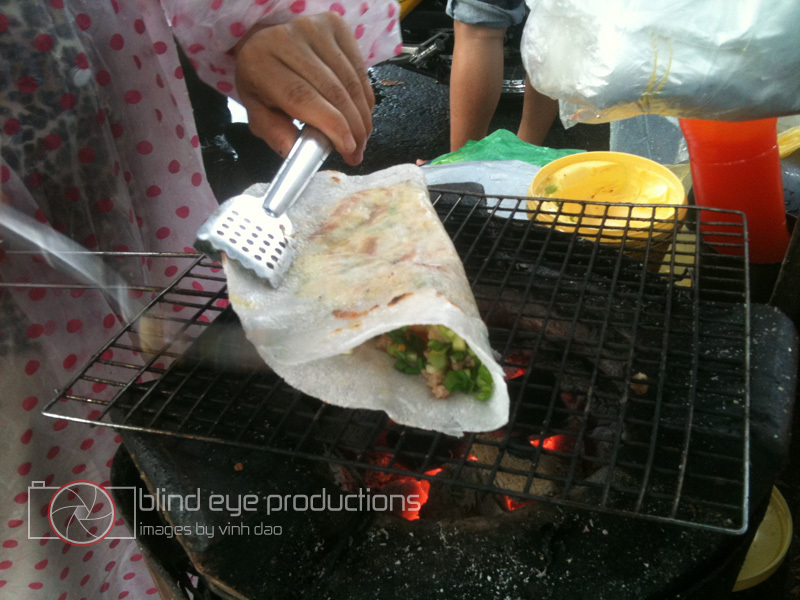 It didn’t hurt that the vegetables were fresh and nicely seasoned. All in all, a great trip down memory lane. 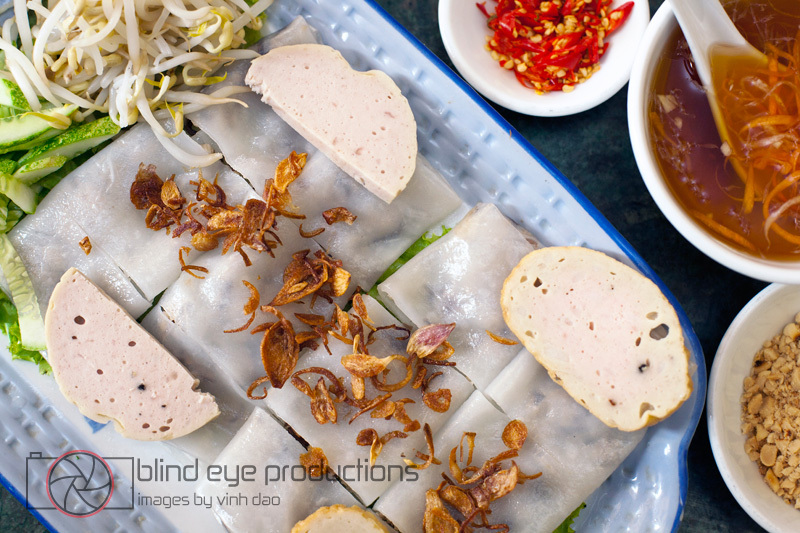 I am by no means an expert on Vietnamese food, but I am an enthusiast. 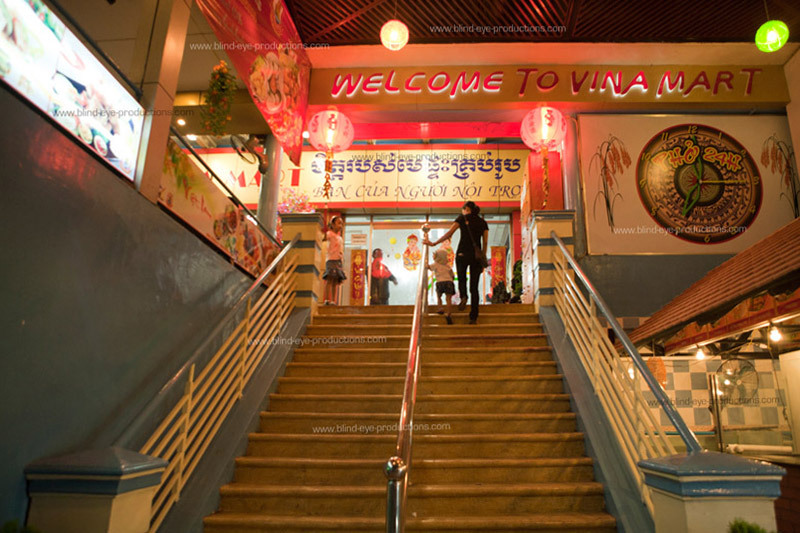 As such, I was delighted to try this place as my initiation into the Nyam Penh scene. Executive summary is that this is the best Vietnamese food I’ve had so far in Phnom Penh, or at least tied with the restaurant downstairs (which may or may not be owned by the same people). 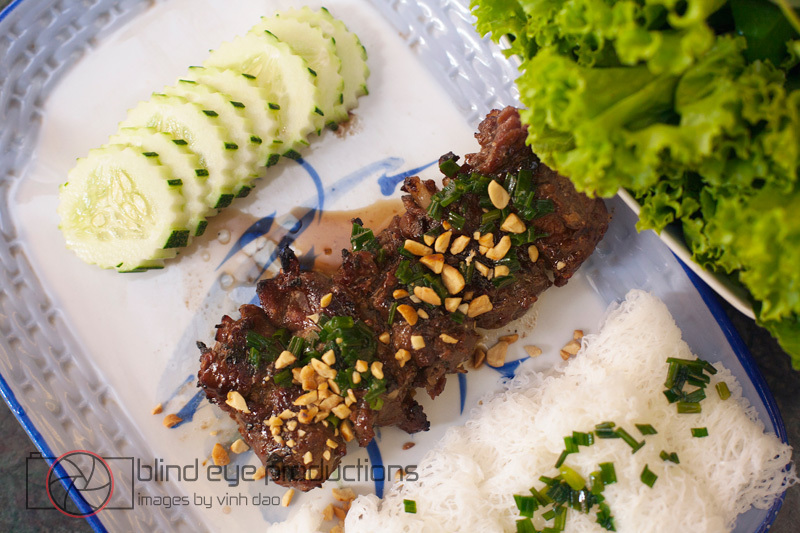 Beef in vinegar is my go-to dish in Vietnamese restaurants and this one did not disappoint. Because it was my first time meeting the gang I decided not to drink the broth, but I easily could have. 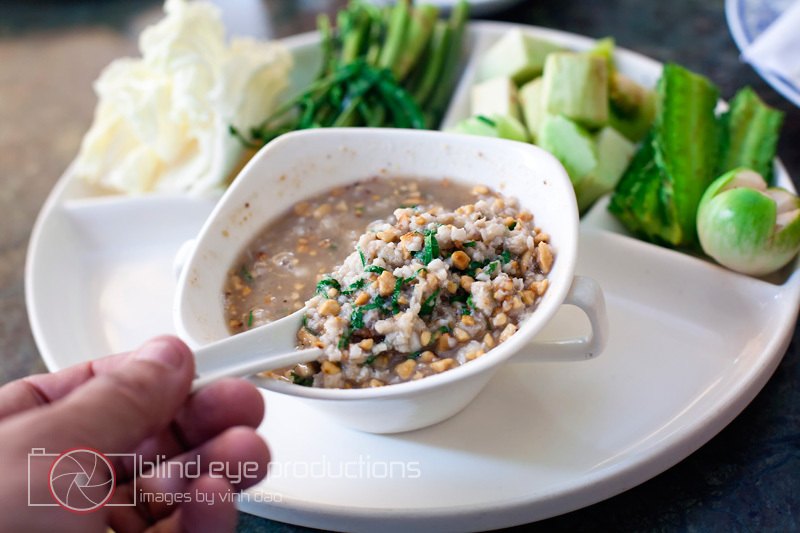 The combination of vinegar and lemongrass is fantastic, and I appreciated that they went heavy on the lemongrass–it wasn’t too much for me. I also thought the rare beef salad was excellent, and I ate more than my fair share of it. As soon as we walked into this place, I liked it. 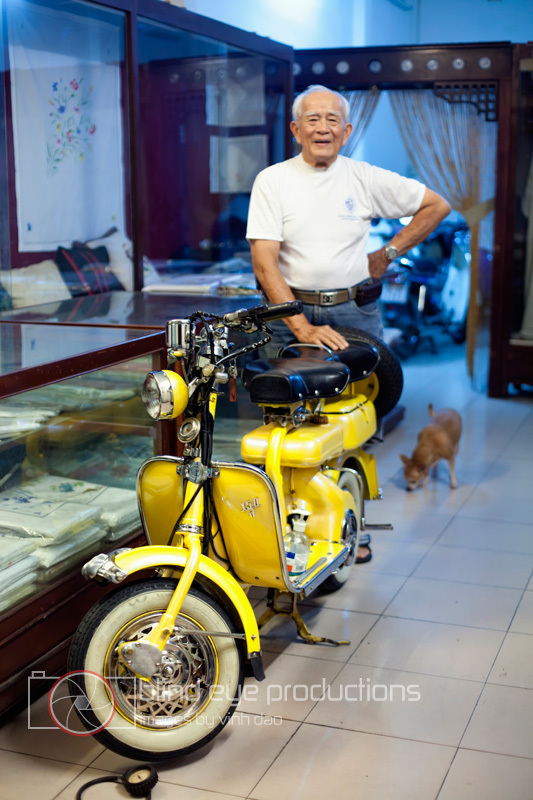 It reminded me of places I had been while visiting Hanoi. 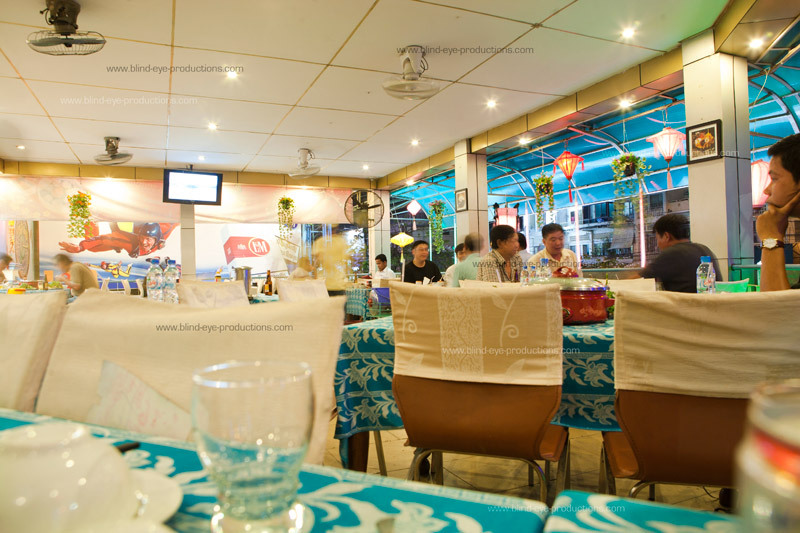 Ngon was absolutely beautiful but I never ate anywhere like that in Vietnam. Loud colors, plastic plants and flashing lights felt much more authentic. The ribs that came out first were amazing. Maybe it was because we had had a few beers before dinner but, wow, I would have been happy eating just ribs that night. There is a huge ‘Banh Xeo’ sign painted on the outside of the restaurant so I wanted to try it thinking it might be their specialty. 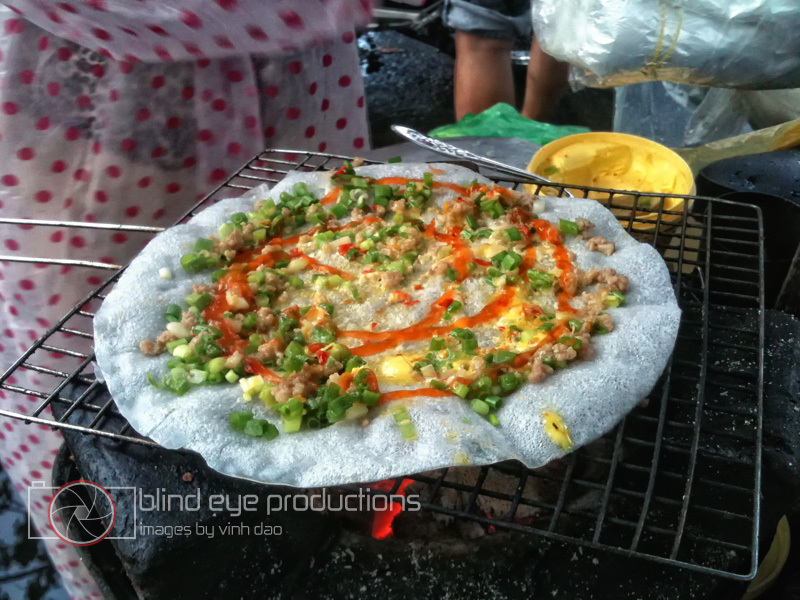 It wasn’t the most amazing tasting banh xeo I’ve had but it was probably the biggest. All five of us at the table were able to have a decent portion. 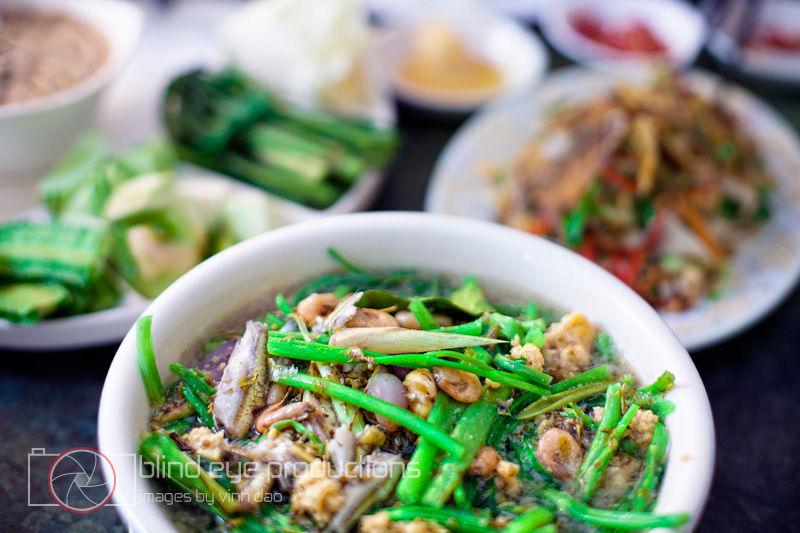 The Muc Chien Ngon, aka, Vietnamese calamari, was good but you can pretty much deep fry anything and it will be pretty good. But the highlight for me was definitely the Bo Nhung Dam. They let the pot filled with the vinegar broth and onions simmer on our table for a while before they moved it over to the middle of the table. Any sort of hot pot dinner is always the best group meal but would have been slightly nicer if we were at a round table (John had to reach pretty far to get to the pot). Again, Vietmart was generous with the portions and we all had plenty and with beers for less than a buck, this place is definitely solid. 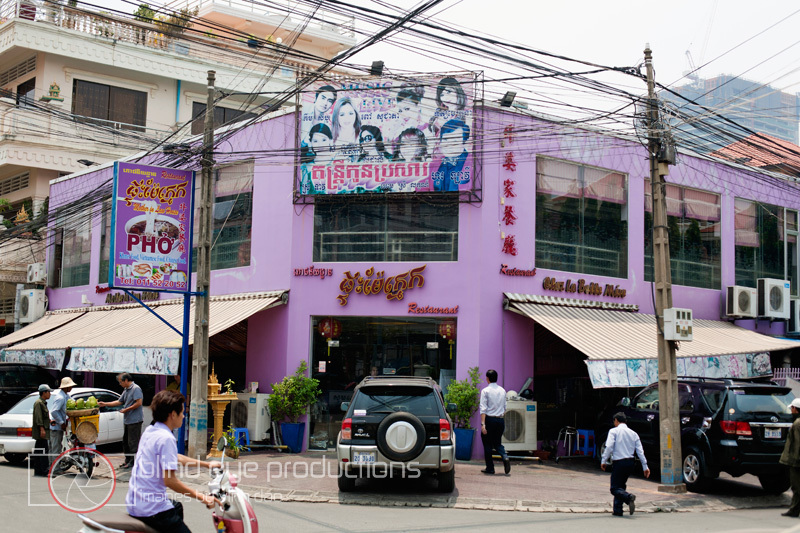 On the corner of Monivong and street 242 across the street from the 24 hour BB World.